Apparently the miniature lightsaber can’t make you look more like a Jedi Knight, but you want to be the focus in a Star Wars themed party, the glowing lightsaber earrings may help you. This is a pair of pretty cool glowing earrings inspired by Star Wars, the famous sci-fi epic, and handmade by Anya from Lisbon. 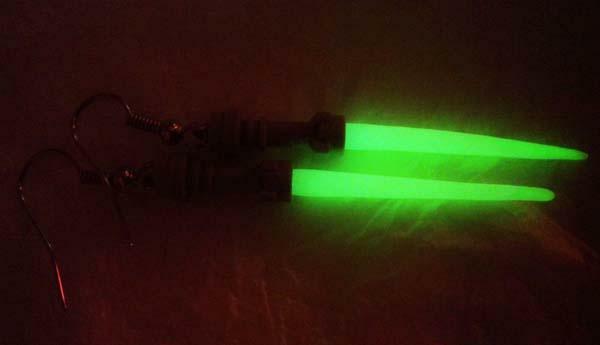 As we can see from the images, each earring is shaped as a miniature lightsaber, and along with nice details like plastic hilt, while using silver plated or gunmetal plated earring hooks you can easily wear the two lightsabers on your ears. Most importantly, the blades with glowing material is able to glow after charged with real sunlight or normal house lighting for an incredible visual effect. 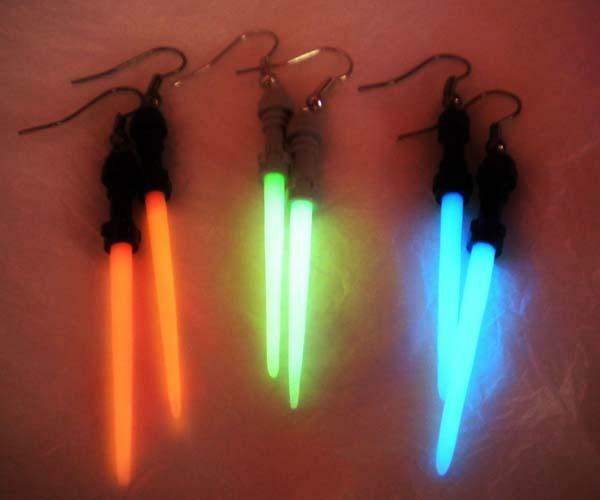 The pair of Star Wars lightsaber earrings is available in three colors, each pair is priced at $22.15 USD. If you’re interested, jump to Etsy for more details.